Coil Encl Fly leads/Terminal Box/Plugin- Conn.
Seat NBR / VITON / Neoprene / Teflon / EPDM / SILICO. Coil Type Size I / Size II. We are comprehensively engaged in offering a wide and superior range of Auto Drain Valves. 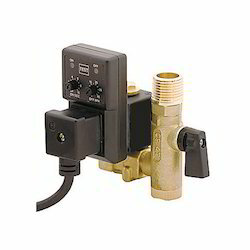 These Automatic Drain Valves offered by us are made utilizing brass, stainless steel and aluminum, sourced from reliable vendors of the market. In addition to this, the offered range of auto drain valves is highly acknowledged among the clients, owing to its precise engineering, rigid construction, corrosion resistance trouble free operations and superior performance. These auto drain valves are with adjustable timing.